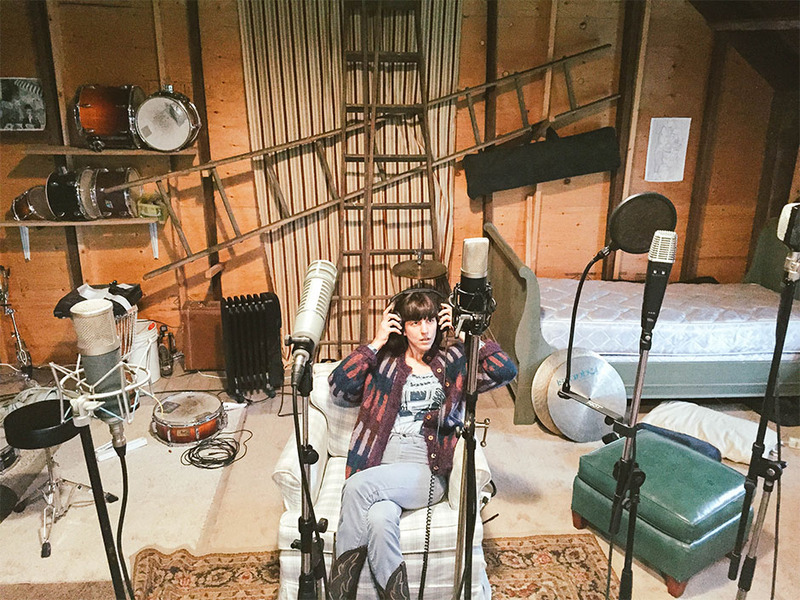 You might know Eleanor Friedberger as one half of brother-sister duo The Fiery Furnaces, but after 2011 she ventured on her own, releasing a total of three, full-length solo albums. Up until her recent record, New View, most of her material related directly to her long-time home of Brooklyn — her songs acted as urban vignettes while the lyrics weaved together clever observations. But with her recent move to upstate New York, her songs take on a different kind of space, one that feels more expansive and lyrically more ambiguous. In trading her city life for more rural pastures, Friedberger has infused her music with bygone eras and places. Layer this with an analog approach and barn-built studio, and the music exudes location unlike any of her previous records. In our conversation with Friedberger, we explore travel, her decision to leave the city, and the inherent connection between music and place. Do you think music and place are intrinsically tied or does music transcend place? I had these five reggae comp cassette tapes that someone had made for my brother in the ‘90s — I remember going to Greece with my mother and my brother and I took the cassette tapes with me. Driving through the southern mainland of Greece, listening to this reggae music, I remember saying something stupid like, “This looks like we’re in Jamaica,” and my brother was like, “what are you talking about? It looks like Greece.” At the time I had never been to Jamaica. I’ve been twice since but it was funny in that way. It was warm, and I think of Jamaica as warm, but I think the music informed the environment in that instance. I took a trip to Jamaica several years later with a friend who owns a record store in Los Angeles. We listened to all this incredible old rocksteady and reggae music. So now I can listen to that music and it just immediately takes me back to that place. So that music can bring you back to its place of origin or to Greece and it works both ways. Right, very different places and people, so it has that sort of power. I’ve been trying to think a lot about this in the record that’s coming out in January, and how to me, it doesn’t sound like a city album, and what that even means. To me it sounds like open spaces; it sounds more like California; it sounds more like upstate NY where the record was made. But I’m not sure why. There must have been some conscious decision to get out of the city to record this? Were you trying to communicate that place through the music, or did it just happen organically because you were there? I think it’s the latter. I wasn’t trying to do that, but I moved out of the city a couple of years ago and worked on these songs mostly in Los Angeles before coming back to New York to record it, so it made sense that it should have that effect. But like I said, it’s really hard to put your finger on why exactly. Can you walk us through the production process and how that had anything to do with it? I wrote the songs on my own, but I presented them to my bandmates who I’ve been touring with, and we worked on the arrangements together in a rehearsal room in LA. Then we came back to New York to record them with a friend of one of my bandmates who built a studio in a barn next to his house. We did a combination of recording in an analog way and also digitally, but all of the basic tracks were recorded onto tape with everyone playing together in a room. I hate using that word “organic,” but it should feel like that because it was a live band. Do you think having recorded it that way affects your live performance? Oh yeah, for sure. I think a lot of bands work this way — a lot of bands who are actual bands and don’t play pre-recorded music. We worked on the songs and played a bunch of shows on the west coast before we recorded them. So it’s actually the opposite; I think playing them in front of an audience informed how we recorded the album, which is something I had never done before. Is there any particular song you’ve written recently that is attached to a certain place? Oh, so many. On this album there weren’t as many, which I was trying to be conscious of. My other two albums actually have the names of the places in the titles. I wanted this one to be a lot more vague so that anyone could insert themselves into the stories. But on the first song of the album that we’ve already put out, I mention walking over a bridge, and that’s very much about New York. Is there something about being in a more rural landscape that has changed your mindset at all about music or creating in general? I use it in different ways. Now I have a house where there’s a room next to the kitchen that’s basically just records, a record player and a couch. I only listen to records when I’m in there or when I’m cooking, and now there is certain music that I associate with cooking or being able to sit in that room. I also have a place to play music where I live in this huge, huge space with huge windows. Most people who practice in the city practice in closet-sized rooms with no windows, so it’s incredible to just get to play, even if I’m just practicing by myself in this space looking outside. It’s a totally different feeling. Do you have any favorite stops in Europe or the US that you’re looking forward to on your tour? There’s nowhere bad. I have to say, without sounding too corny, I’m pretty grateful to play anywhere. I’ve made myself have that attitude. Even in places where you think they’re just going to be terrible, there’s something good about it. I’m excited about our upcoming US tour because I’m actually playing in a place I’ve never played before, which is Boise, Idaho. Musicians travel so often and they can sometimes become uninterested in the places they visit because they’re there for such a short period of time. Do you still try to explore, or do you hunker down and take care of yourself? It depends. I’ve been touring with these guys who I made the record with and have been playing with for a couple of years. They’re much younger than me and they haven’t done that much touring. About two years ago I toured with them for a month, and they were so excited. They hadn’t been to most of these places so their enthusiasm was really contagious. Before that I had been playing with the same people for a long time — people who had a lot of experience, and like you said, it’s all kind of the same after awhile. But it was nice to surround myself with some people who hadn’t done it before. It made a big difference. But I still tour in a van, so we’re driving most of the day, and I’m lucky if I have time to do anything. If we do have time or a day off we try to take advantage of it. This article originally appeared in Travel With Purpose Issue 03. Shlomo Franklin Delivers a Romantic Request in "Don't Love Anybody"